The church of San Miniato al Monte was originally begun in 1018 on the site of a 4th century chapel. The adjoining bishop's palace was built in 1295-1320 while the unfinished bell tower is from the 15th century. 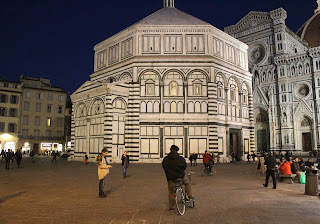 The baptistery of St John was built between 1059 and 1128 as the third baptistery on the site. The first was constructed in the late fourth century or early fifth century. The marble supposedly came from Fiesole, which was conquered by Florence in 1078, while the rest came from ancient structures. The lantern was added in 1150, while the entrance porch is from 1202. Palazzo Vecchio was originally built in 1299-1314 as the city hall of Florence. The design is attributed to Arnolfo di Cambio, who also gives his name to the 94-metre bell tower Torre d'Arnolfo. The tower was built on top of the previous Torre della Vacca, and this is supposedly the reason why it is off-centre relative to the main facade. The palace was extended in 1342-43 and the courtyard was redesigned by Michelozzi Michelozzo in 1453. Further extensions were completed toward the end of the 15th century, including a second courtyard by Cronaca (Cortile della Dogana) and the main hall (Salone dei Cinquecento). Both Michelangelo and Leonardo da Vinci were commissioned to fresco the walls of the main hall, but neither one of the completed the task. The Salone dei Cinquecento was instead decorated with frescoes by Giorgio Vasari in 1563-65. Vasasri was also involved in the re-decoration of the first courtyard and the extension of the building to Via dei Leoni. This extension, which included a third courtyard, was completed by Buontalenti in the late 16th century. Also known as Palazzo della Signoria, which is still the name of the square, the name vecchio refers to the Palazzo Pitti as the Palazzo Nuovo. Orsanmichele was originally built as a grain market in 1337 by Francesco Talenti, Neri di Fioravante and Benci di Cione. It was converted into a church for the craft and trade guilds in 1380-1404. The statues are copies of the originals, which were commissioned by the guilds in the early 15th century. The design of Palazzo Rucellai has been attributed to Leon Battista Alberti and dated to 1446-51, though this is still subject to debate. Actual construction was probably piecemeal and not completed until 1460s when the Rucellai family succeeded in buying the neighbouring properties. In fact, the facade should have been one bay wider than what was built and lacks symmetry as a result. A very similar design is used on Palazzo Piccolomini in Pienza by Bernardo Rosselini, which could be the architect for both palaces. It is seen as the first consistent attempt to apply classical orders to palace front, an inspiration which probably came from the Colosseum. The use of a richer Corinthian order on the first floor doesn't match the classical model but is consistent with the contemporary idea of a piano nobile being the most important part of the building. The facade of Santa Maria Novella was built in 1458-70 and was likely designed by Alberti in the 1450s. The architect seems to have compromised on his classical ideas due to the gothic forms of the church, which had been begun in 1246. Some work on the facade had started in 1310. His choices in design may also be due to respect for local tradition, as exemplified in the church of San Miniato. Alberti had previously used classical columns on the Tempio Malatestiano in Rimini, which was also a pre-existing church, and on the Rucellai chapel in San Pancrazio. The facades of the later churches of S. Sebastiano and S. Andrea in Mantua are loosely modelled on temple fronts. Construction of Palazzo Gondi was begun in 1490 and had been completed by 1498, to a design by Giuliano da Sangallo. It is similar in style to the earlier Palazzo Medici but the surface treatment of the facade is smoother as had become common toward the end of the century. The Palazzo Grifoni or Budini-Gatai was originally begun in 1557 to a design by Giuliano di Baccio d'Agnolo, who also was responsible for the Palazzo Grifoni for the same client in San Miniato. It was continued after the death of d'Agnolo by Bartolomeo Ammanati in 1563, possibly on the basis of designs by Michelangelo. Parts of the facade were only completed in the 18th century, however. The facade of Palazzo delle Due Fontane (left) is from the early 19th century and was made to harmonise with Grifoni. A similar consideration determined the design of the loggia of the Servites (right), which was begun in 1616 to mirror Brunelleschi's Foundling Hospital from 1419-36. This work also involved d'Agnolo as well as Antonio Sangallo the Elder. A similar loggia was added to the church front of Santissima Annunziata in 1601 by Giovanni Battista Caccini in 1601. The equestrian statue in the middle of the square is of Grand Duke Ferdinand I.
San Frediano in Cestello was built in 1680-89 to a design by Gherardo Silvani. The dome was added in 1689 by Antonio Maria Ferri. It replaced a previous church from the 1450s. The columns on the facade of San Pancrazio were moved to the present location after the deconsecration of the church in 1808, but originally stood inside. They were made to a design by Alberti to support the entrance to the Rucellai chapel. The passage to the chapel was bricked up in the early 19th century and was only recently reopened. It houses the Rucellai sepulchre, which is a marble shrine designed as a miniature of the Holy Sepulchre in Jerusalem. The chapel is dated to 1458-67. 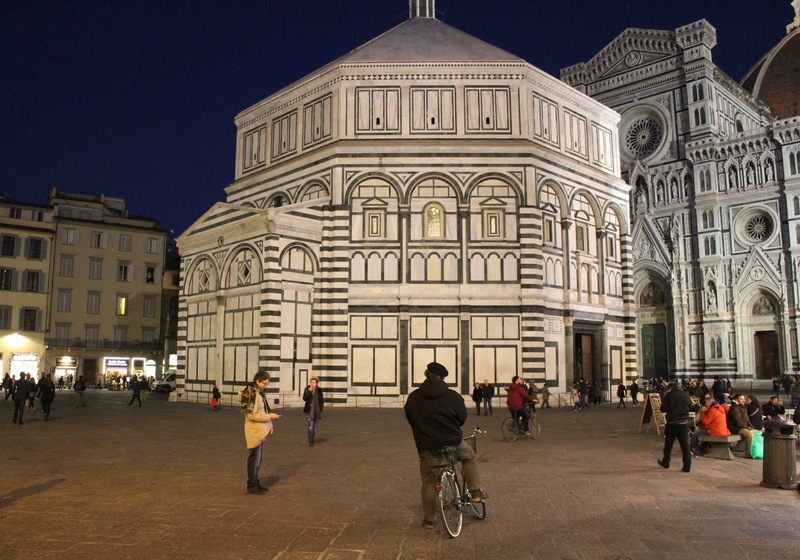 The facade of Santa Croce is dated to 1857-63 to a design by Niccolo Mata. Construction of the church first began in 1294 or 1295 and the design has been attributed to Arnolfo di Cambio on stylistic grounds. It is known that the nave was still unfinished in 1375 and consecration was delayed until 1442. The slow progress was possibly due to opposition within the Franciscan order, from factions wishing to observe the rule of absolute poverty. 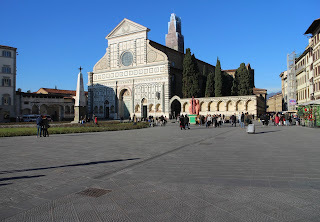 Unlike Santa Maria Novella, the church was not built with a stone vault but has an open timber roof instead. The chapter house in the adjacent convent, known as the Pazzi chapel, was originally designed by Brunelleschi around 1429-33. It wasn't completed for 40 years and changes were made to the exterior.